and the outcome was monumental. GORUCK is a mid-market, B2C sporting goods retailer with the spirit and potential of a much larger company. In search of a new platform to support their many events and promotions, GORUCK teamed with Mozu. They keep a fast pace, and needed a dynamic eCommerce platform that was up to the task. 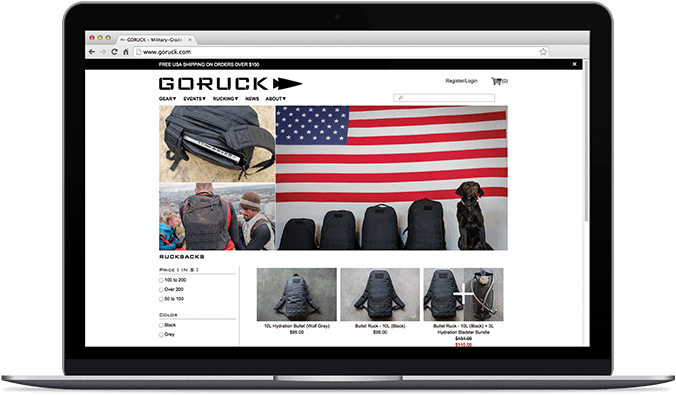 After integrating with the Mozu cloud commerce platform, GORUCK’s marketing team doubled their productivity, their page load times were significantly reduced, their mobile and desktop websites were transformed into one fluid digital experience, and they grew their online revenue by 48%. "The event integration gave us more power. We have a lot of events and if you’re looking at one of the types, you can sort it. Previously, the users couldn’t tell how or didn’t think to sort. Having the map API allows that to be presented graphically and is a huge win for usability." In the beginning, GORUCK was frustrated with their NOPCommerce platform on Amazon Cloud. While highly customized, it wasn’t what they needed. Dubbing it a “pile of mess,” their business suffered from its slow performance, shoddy mobile experience, and poor events integration. At a ten-second average, page loads were glacially paced, and their servers struggled to load new events. 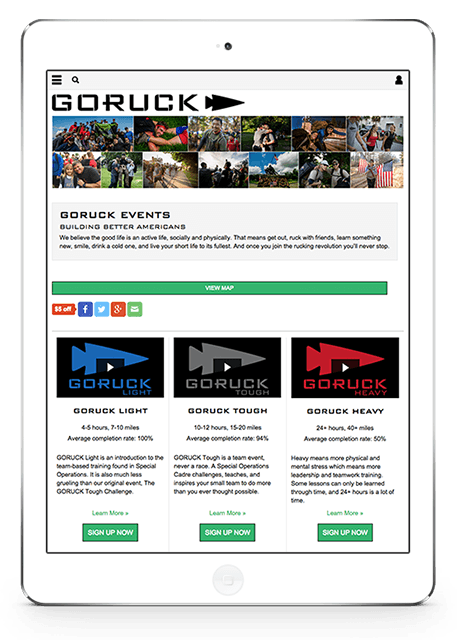 GORUCK’s mobile experience was rocky; users would find the event map replaced with an event list to cut back on load time. In actuality, this Band-Aid solution reduced usability and frustrated customers. Finally, everything on the site was hard-coded, meaning that every change—no matter how small—required the intervention of an IT resource. 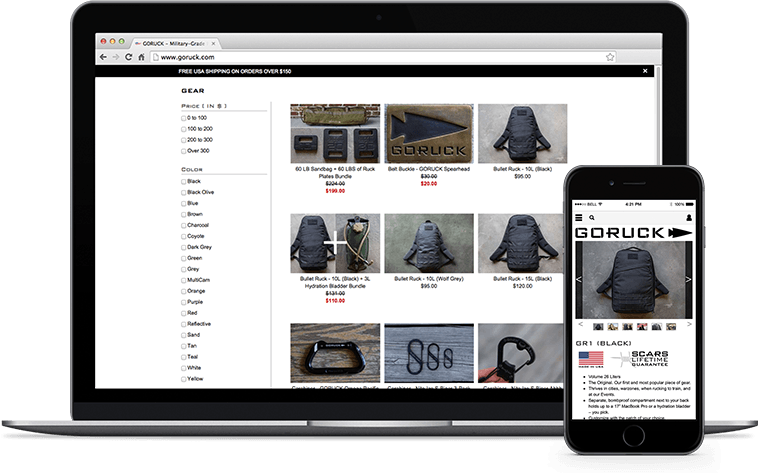 GORUCK’s decision makers knew that Mozu possessed the flexibility that would allow their business users reliable access, and the ability to optimize the site for any device. The Mozu API would help them integrate events in a sustainable and extensible way. By implementing an event management widget – among many others – their marketing team could finally manipulate the site without IT resources. With Mozu they could produce a superlative, customizable mobile shopping experience boasting rapid load times. To dramatically reduce page load times, GORUCK trusted Mozu’s multi-tenant SaaS approach, noting its scalability and performance optics. Now they could easily maintain a consistent shopping journey from mobile to desktop. All of this was impossible with their old platform. Results of Switching to Mozu?